You see, the Agora Financial Copywriting Process is so powerful, newbie marketers and copywriters — who’ve never written a word of copy before — are mil dollar campaigns in just days using it. The Most Coveted Copywriting Method On The Planet! They started as a small publishing company, and today generate over ONE BILLION in annual sales. They generate over 3 MIL A WEEK! turning Them Into the best Marketers & Copywriters In Just Days! I’m talking about you having the power to make money almost any time you’d like. No more writer’s block… no more not knowing what to say or how to say it… no more endless hours working on copy only to have it flop… and no more campaign duds. Never again! 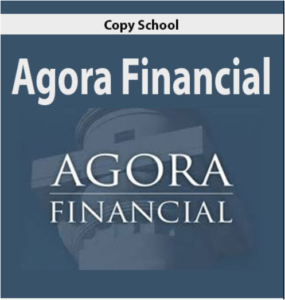 Agora financial is da bomb! All times are GMT +6.5. The time now is 11:11 PM.